The window of opportunity for humanity to cap global warming by slashing greenhouse gases is closing faster than previously thought, according to a study released Tuesday. Earlier estimates of our “carbon budget”—the amount of heat-trapping carbon dioxide we can still put into the atmosphere without warming Earth by more than two degrees Celsius (3.6 degrees Fahrenheit)—have ranged from 590 billion to 2.4 trillion tonnes. 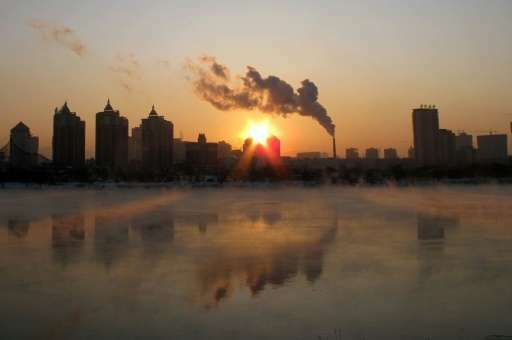 The new research says the upper limit is actually half that, some 1.24 trillion tonnes of CO2. “We have figured out that this budget is at the low end of what studies indicated before,” said lead author Joeri Rogelj, a climate scientist at the International Institute for Applied Systems Analysis in Austria. The goal of holding the rise in surface temperature to 2C—widely seen at the time as the threshold for dangerous warming—was first agreed by the world’s nations in 2010. But thousands of subsequent scientific studies have showed that even a smaller jump on the thermometer would have severe consequences, especially for poor nations. With an increase so far of less than 1C (1.8F) over pre-Industrial Revolution levels, the world has already seen climate-boosted droughts, floods and megastorms. As a result, the Paris Agreement adopted by the UN climate forum in December last year embraced a more ambitious target of “well below 2C,” while pledging to strive for a 1.5C cap if possible. CO2 emissions were about 40 billion tonnes in 2015, and are projected to continue climbing over the next decade, even taking into account the carbon-cutting pledges submitted by nearly 190 nations as part of the Paris Agreement. If current emission rates are held steady, the 2C carbon budget would be spent in about 15 to 30 years, according to the new calculations. 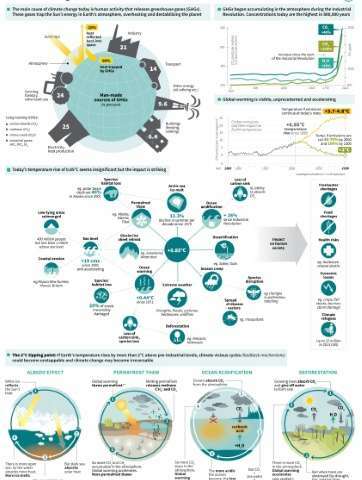 For a 1.5C target, the carbon budget “would be exhausted in about one decade,” Rogelj told AFP. “It is beyond doubt that ambition thus needs to be increased radically from anything we have experienced to stabilise warming at either 1.5C or 2C—or even higher temperature levels,” he said by email. Rogelj and half-a-dozen colleagues sought to understand why previous estimates of the carbon budget vary so widely. Part of the gap stems from different methods and scenarios that project trends into the future. Another factor is that many studies looked only at the dominant greenhouse gas CO2, using it as a proxy for all others, including methane and nitrous oxide. Carbon dioxide accounts for more than 80 percent of global warming. “Neglecting the warming from other greenhouse gases leads to larger carbon budgets,” Rogelj explained. Focusing only on CO2 helps scientists understand how the Earth system works, but is not very useful for real-world policy, he added. Global warming went into overdrive in January, leading to astounding temperature records. January was the globe’s most unusually warm month ever recorded, and the past three months have been the most unusually warm three-month period on record as well, according to new findings from NASA. 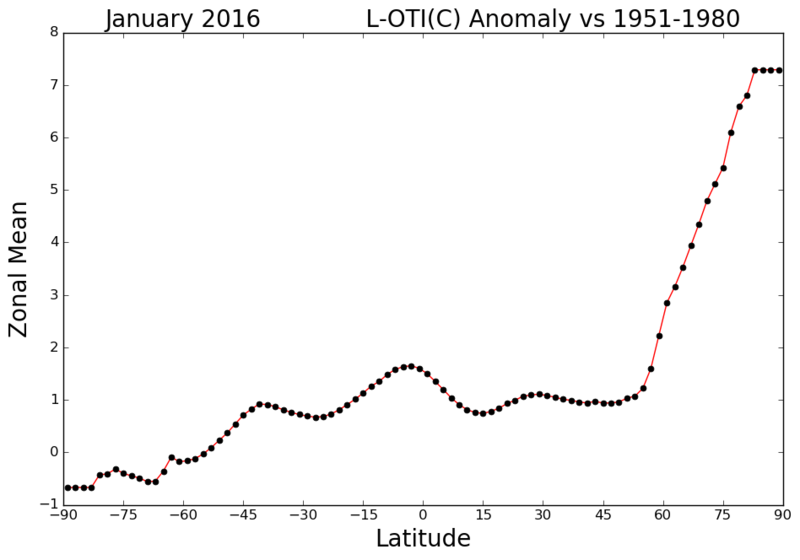 January was also the warmest such month on record, NASA found, in preliminary data released this weekend by the Goddard Institute for Space Studies (GISS) in New York. The data, which is subject to adjustment as scientists refine their analysis, shows that the combination of accelerated manmade global warming from the burning of fossil fuels, such as coal and oil, is combining with a record strong El Niño to bump up temperatures to never-before-seen levels since at least 1880. Animation of NASA temperature anomalies from Oct. 2015 through Jan. 2016. According to NASA, the global average surface temperature during January was 1.13 degrees Celsius, or 2.3 degrees Fahrenheit above average, compared to the 1951 to 1980 average. This makes it the first month to exceed 2 degrees Fahrenheit above average. December’s global average temperature came in just under this, at 1.11 degrees Celsius above average, which translates to nearly 2 degrees Fahrenheit above normal. The previous record warm January in NASA’s records was January of 2007, when global average temperatures were 0.95 degrees Celsius, or 1.71 degrees Fahrenheit, above average. That year, like 2015, was also an El Niño year. 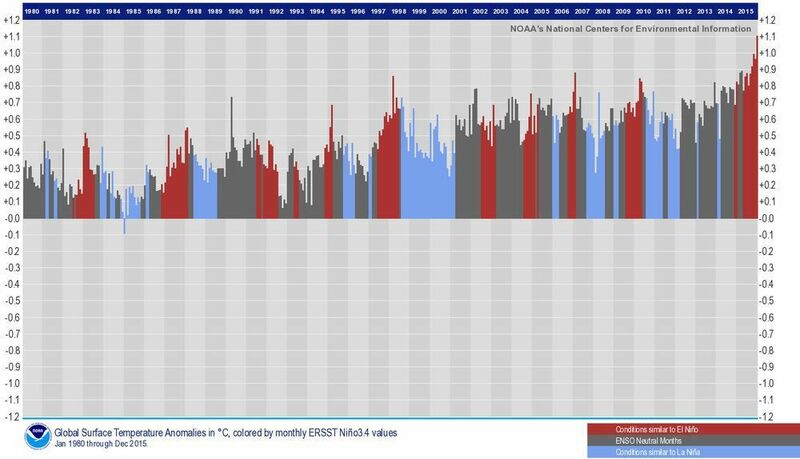 The period from November through January was the warmest three month period on record, NASA data shows, with an average global temperature of 1.1 degrees Celsius, or 1.95 degrees Fahrenheit, compared to the 20th century average. Map showing temperature departures from average by latitude, clearly indicating the largest departures in the Arctic, which begins at about 66 degrees North latitude. Much of the unusual warmth through the winter so far has been observed across Siberia, much of the Arctic, parts of Central Asia as well as Canada and Alaska. In the Arctic, above average air temperatures have helped to keep sea ice to record low levels, and a record low sea ice maximum may be set in March. Arctic sea ice extent for the month of January hit a record low. The monthly average sea ice extent for January was 42,500 square miles below the previous record low in 2011, and about 405,000 square miles below the 1979-2000 average. For perspective, that departure from average is equivalent to missing a region of ice the size of the states of Texas, New Mexico, Maryland and New Hampshire combined. NASA isn’t the only agency showing record warmth in January, although the baseline years used to determine temperature anomalies do affect the anomalies and rankings, along with other factors. 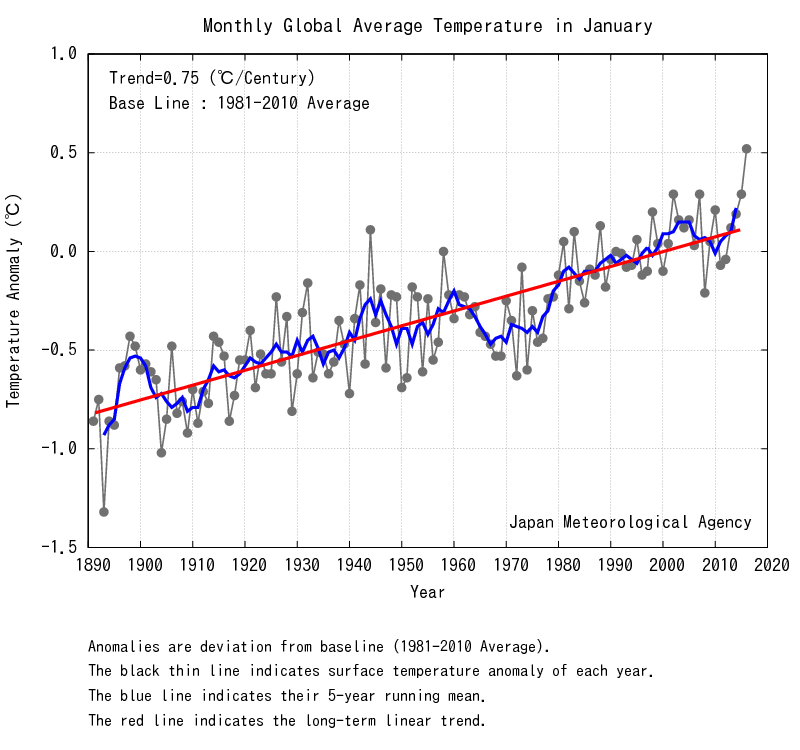 The Japan Meteorological Agency (JMA), which is another agency that keeps tabs on global average surface temperatures, also found that January 2016 was the warmest such month on record. Japan Meteorological Agency global average surface temperature anomaly for the month of Jan. 2016. However, the JMA data shows that January had a slightly lower departure from average compared to December 2015, with the monthly global average temperature anomaly of 0.52 degrees Celsius above the 1981 to 2010 average. This was 0.91 degrees Celsius, or 1.6 degrees Fahrenheit, above the 20th century average. This was the warmest January since 1891, the JMA found. According to the JMA, December had a temperature departure from the 20th century average of 1.04 degrees Celsius, or 1.9 degrees Fahrenheit, and November was 0.88 degrees Celsius, or 1.6 degrees Fahrenheit, above the 20th century average. The National Oceanic and Atmospheric Administration (NOAA), which is the other U.S. agency that tracks global temperatures, also found that January was the warmest such month on record. This makes January 2016 the ninth-straight warmest month on record, NOAA said in a press release on Wednesday. The NOAA also found that global average land and sea surface temperatures were more than 1.04 degrees Celsius, or 1.87 degrees Fahrenheit, above the 20th century average. This temperature anomaly was not high enough to set a record, though, possibly owing to the different ways that NOAA and NASA incorporate Arctic weather station data. No matter what NOAA’s rankings turn out to be, though, it’s already clear that January, as well as this winter so far, stand out as the most unusually mild period on record since instrument records began in the late 19th century — and very likely long before that. The El Niño event in the equatorial tropical Pacific Ocean is playing a role in boosting global temperatures, since the presence of unusually mild waters across such a vast and strategic expanse of the Pacific acts as a heat pump, effectively transferring back into the atmosphere some of the excess energy that has built up in the oceans due to global warming and natural processes. Lest one pin all the blame on El Niño, though, it’s noteworthy that no past El Niño year — not even years with El Niño events as strong as this one (the only comparable event occurred in 1997-98) — have come close to the temperature anomalies seen during the past several months. 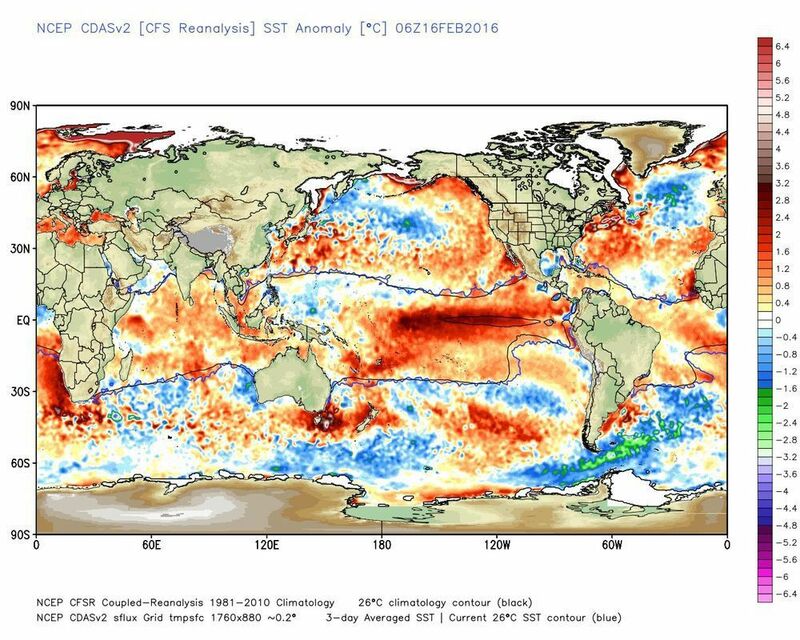 Global sea surface temperature anomalies, showing the telltale strip of red in the tropical Pacific associated with El Niño. Simply put, it’s easier to set warm temperature records now than it used to be, particularly when manmade forces line up with natural climate variability like El Niño. Deke Arndt, the director of climate monitoring at NOAA’s National Centers for Environmental Information in Asheville, North Carolina, has offered a useful analogy that helps explain the relationship between manmade climate change and El Niño. Long-term warming is like riding an escalator up over time – it moves you consistently to higher values. El Niño is like jumping up during that trip. You reach new heights when the long-term effects are combined with the short-term jumps,” Arndt said in an email to Mashable. Temperature anomalies during El Niño and non-El Niño years over time. “These two factors — long-term warming and El Niño — have worked together to give us this recent run of unprecedented warm months,” he wrote. According to Arndt, each intense El Niño adds about 0.5-degree Fahrenheit to the global temperature during the course of the event, which is less than the 1-degree Fahrenheit of global warming since the early 1980s. “Where you are on the escalator matters! The decades-long ride on the escalator has moved us significantly further from where we started than any individual El Niño,” he wrote. “A strong El Niño event can elevate the monthly global temperature by up to 0.2 degrees Celsius,” he said in an email. The lingering influence of El Niño may mean that 2016 will also set an all-time annual temperature record, since the atmospheric effects of El Niño tend to be delayed by several months when compared to the oceanic impacts. This post was updated on Feb. 17 to include the results of NOAA’s global temperature analysis.